August Roundup: What's The Future of Quality? 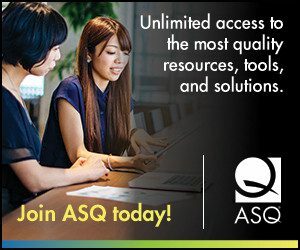 Last month, ASQ’s Influential Voices bloggers wrestled with a big question: What road will quality take in the future? In his August blog post, ASQ CEO, Bill Troy laid out two scenarios—one evolutionary and one revolutionary. Some bloggers took one view or the other, while others explored how the counterpoints merge or complement each other. Take a look. Evolutionary: Anshuman Tiwari writes that quality is evolutionary by nature, not revolutionary, and that’s fine. Edwin Garro notes that “we quality professionals surely are the basic units of an autopoietic system“–that is, one that can reproduce and maintain itself as necessary. Jennifer Stepniowski writes that a cautious revolutionary approach that doesn’t forget its roots generally thrives. And John Priebe adds that an evolutionary approach is superior to a revolutionary one. Revolutionary: Aimee Sigler proposes that sustainability is the truly revolutionary idea in quality. Rajan Thiyagarajan makes the case that the future of quality will be revolutionary–as does Nicole Radziwill. “We’re going to need new models for business, new models for education, and new models for living if we are to satisfy the stated and implied needs of an increasingly interconnected Internet of people and things,” she writes. And Don Brecken sees the future of quality as a battle. Neither? Scott Rutherford asks if conditions exist for a quality revolution, finding that they do not, as quality is rarely part of educational curriculum. Guy Wallace writes about the role of marketing principles in the future of ASQ. Dan Zrymiak believes that quality is moving from control and performance excellence to emphasizing innovation. Author ASQ CommunicationsPosted on September 3, 2014 Categories case for quality, innovation, Quality, UncategorizedTags future, future of quality, innovation5 Comments on August Roundup: What's The Future of Quality?